Hey, I’m new to this so any feedback would be much appreciated on how to do this better. Would like to know the best way to update my progress too, should I do it monthly, quarterly, in halves or do a whole season in 1 post. Just a heads up too. I just started my 3rd season so the images I posted will be before/after the events I mention happened. With the number of teams rising and falling to the VNN near my area (Wigan), I had a decent number of teams to pick for my journey. There’s Ashton United, Chorley, Altrincham, Stockport, FC UTD of Manchester, Southport, Curzon Ashton. Then if I add the teams near my university in Wrexham, I could pick Chester and AFC Telford. In the end, I decided to go with Chorley, the second closest team to my house, just short of a mile further than Ashton United. 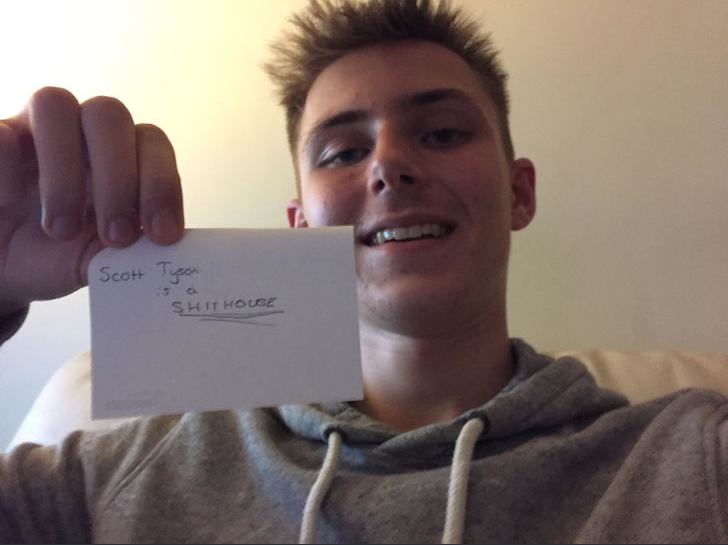 Had 2 friends who played for the under-18’s, lost their manager too in the summer so it felt like a good fit, as I’m not too much of a fan to takeover a club that just got promoted like Ashton United. The bare minimum aim is to get promoted by the play-offs, but the real objective is to win the league. It won’t be easy, but we have the team capable already at our disposal, just need a couple of more players for depth, mainly a left back and probably another winger. The media expect us to win the league with even odds with York City just behind, so we got to work. 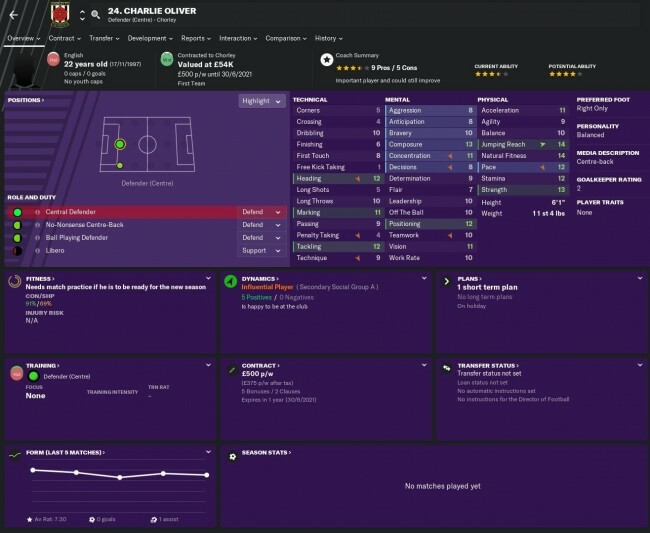 First things first, I brought in Ollie Davenport(GK coach) and Danny Philpott(Scout). Then I went out to find a decent left back. I had Blakeman who was my best left back at the time but was also one of my best midfielders. 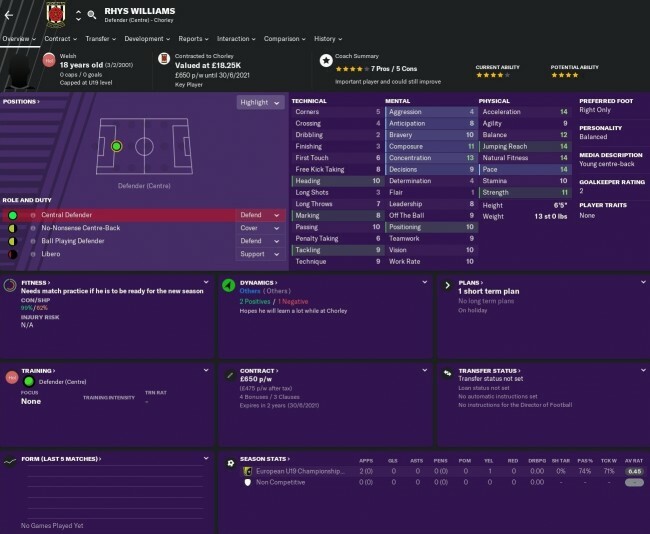 I found Ben Williams from Barnsley who looked pretty tasty, so I brought him in on loan. I also found Érico Sousa from Accrington Stanley. He was better than the Newby brothers and could also play as a left winger to a decent degree. And that was my transfer window. Small and to the point, the players were good enough and enough depth in each position. I will use a 4-2-4 wide formation with an attacking mentality, as that is one of the philosophies I have implemented as well as signing and playing young players. I had Matt Urwin in goal with Stephen Jordan and Andy Teague as my back two, with Ben Williams on the left and Matthew Challoner on the right. Josh O’Keefe and Dale Whitham will take up the 2 midfield roles, Reuben Noble-Lazarus will take the left wind and Érico Sousa on the right. I had three good strikers who I could chose with different roles, so It was a matter of form, but I started with Marcus Carver and Josh Wilson, no doubt there would be some rotation with them two and Wes Fletcher. As for backup I had Dan Eccles(GK), Scott Leather(C/RB), Adam Anson(CB), Adam Blakeman(LB/CM) Courtney Meppen-Walter(CM), Jordan Lussey (CM), Jake Cottrell(CM), Alex Newby(AMR/C/ST), Elliot Newby(AMR), Louis Almond(AML) and even though he’s not in my plans at all, I had Lewis Short (ML) who I cannot lose as he just joined in the summer. 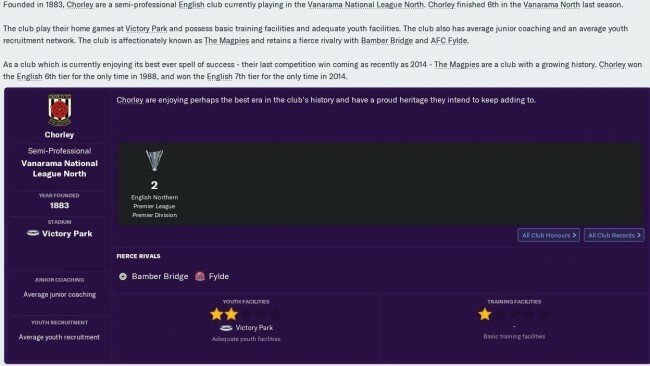 It was a pretty simple pre-season, played the U-18’s (5-0), Longridge (3-0) and Warrington (4-1) for fitness, then gave my players a test against Preston, as well as some much-needed cash from gate receipts and managed to win 2-0. The last match was against Warrington, it served as another fitness test and a morale boost in case we got thumped by Preston, but funny enough despite beating Preston, we drew 1-1 with Warrington. 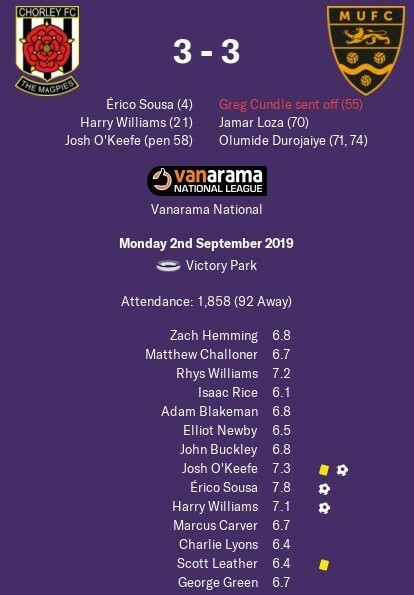 We kicked off the season against our title contender York City and it was not the start I wished for. We managed to score early in the 15th minute, but 10 minutes later York City scored a quick-fire double, scoring 2 in 2 minutes to make it 2-1 to York. We managed to pick ourselves up though with a couple of changes, making Blakeman my first choice CM ahead of O’Keefe and Leather starting ahead of Jordan. We managed to beat Guiseley and Nuneaton until we got a disappointing 2-2 draw with Southport. But kept on an unbeaten streak for a further 5 games, more impressive was that they were all wins! We nest played Alfreton who at the time were 2nd place, but we lost 2-1, which led to us switching places with Alfreton. 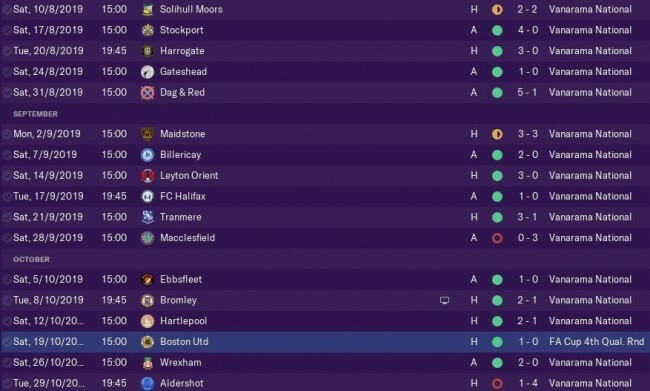 This was a small blip though, as we went on to a 7-game unbeaten run, including a vital 1-0 victory against Altrincham who were in the top 6, as well as a 3-1 victory against our fierce rivals AFC Fylde in the FA cup qualifiers, managing to make the 1st round of the FA cup. Then we played another team who at the time was 2nd place, Stockport. It was a tough game and a match to watch for a neutral, with the result going end to end, ending up 3-2 to Stockport, closing the gap between us and Stockport. It was getting frustrating that we kept losing to title contenders, showing some fight was encouraging but it could easily bite us in the back. I wish I could say we kept our own like last time, but unfortunately, we started to lose our form. After an early lead from Spennymoor who were in a relegation fight, we managed to come back with a 2-1 win. It felt inspiring but on paper, against a relegation threatened team, it was disappointing. Then for the first time this season, failed to score a single goal in a disappointing 1-0 loss to Darlington. We then had a nice distraction, an FA cup tie against League 1 Charlton on TV, which would certainly help with our finances. Despite an early 6-minute lead from Josh Wilson, Charlton fought back to make it 2-1 at half time. It wasn’t to be our day despite our efforts, as Charlton won 3-1. On top of that we had Josh O’Keefe sent off. 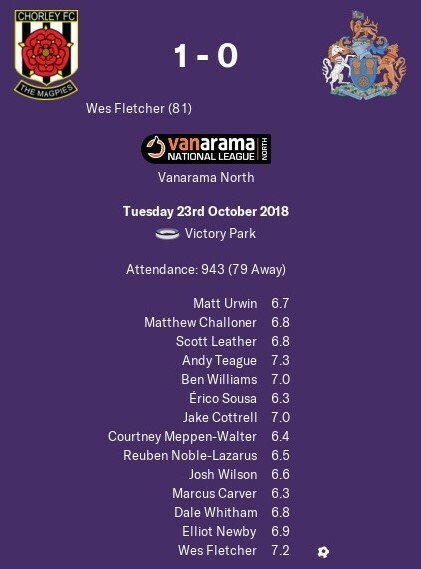 We managed to get an impressive result against Kidderminster just after however, winning 3-0, but our performance in the first half against bottom of the league Chester in the FA trophy was abysmal, losing 1-0, a goal from George Green who also managed to score against us in the game prior. However, we got back into the game with style, winning 5-1. Despite a fighting comeback, we went on to continue our frustrating inconsistent form, starting with a 1-1 draw with Boston scoring in the 91st minute, failing to score in a dreadful 1-0 loss to 10-man Leamington and a poor 1-1 draw with relegation fighting Blyth, again conceding the equaliser in the 92nd minute. We ended 2018 by going through to the 2nd round of the FA trophy after a replay and a 1-0 win against second to the bottom Curzon Ashton. Although we ended 2018 poorly after a strong start, we were still in the title race at 3rd place, not far behind Stockport County (1st) and Altrincham (2nd). 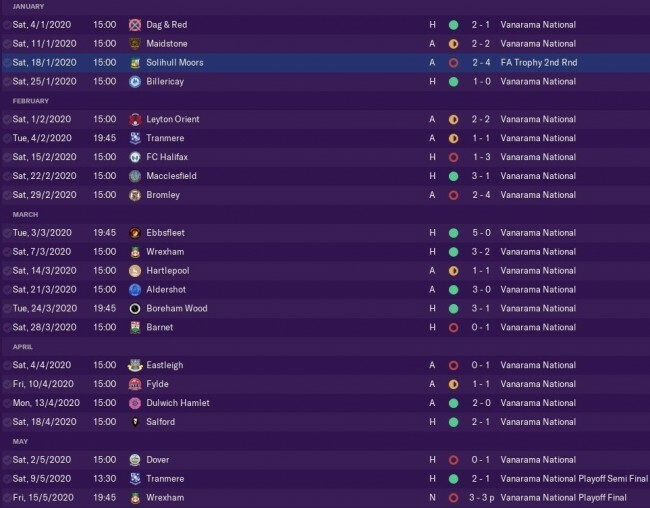 We just had to regroup and start 2019 right, so we did, beating FC United of Manchester twice within a week, both 3-0. However, sandwiched between those 2 decent results, we lost to Hereford 3-1. 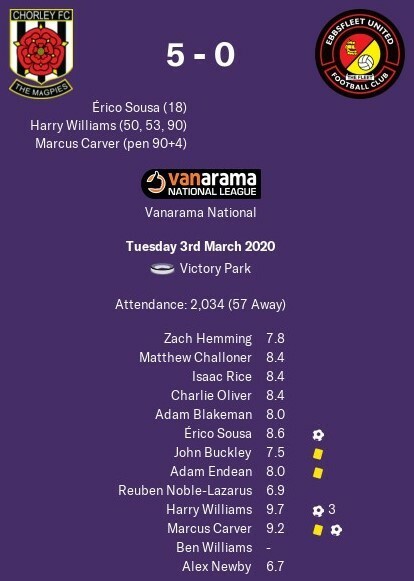 We then went on another inconsistent run, a bore draw with mid table Brackley, followed by a fortunate 1-0 in the FA trophy win over East Thurrock who are fighting relegation in the VNS, then Reuben scored a hat trick in a frustrating albeit entertaining 3-3 draw with Guiseley, who are fighting relegation. We were unbeaten in 4 but they weren’t convincing and against lower to mid table teams, so I was nervous for our next match, York City. Things got a little messy behind the scenes. For while we had about 6 players (Jordan, Almond, Courtney, Cottrell and both of the Newby brothers) wanting more football, 3 of which underperformed when given the chance. This has been a problem since the first month, but things got worse and worse when 2 players, Jordan and Almond, decided it would be fine to try and get their mates to retaliate against me (fortunately they both failed) and then thought training was just an option. Skipping training was the final straw, so I booted them out of the club mutually, I have no time for time wasters. Despite my concerns and conceding first, we managed to beat York 2-1, which kickstarted a further 3 wins in a row, a draw with drifting Alfreton and another win against Ashton. 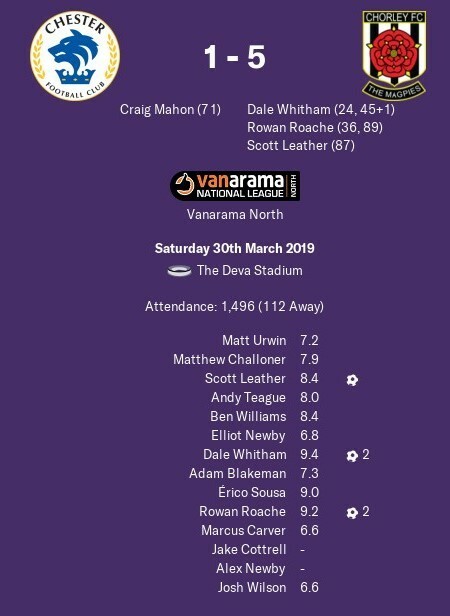 We had a bit of déjà vu, another poor 1-0 loss against Darlington before a fine display against the VNL champions to be Chesterfield, holding them to a draw in the FA trophy, however we lost on the return fixture. 2 wins later, we lost to Leamington again losing our 2-1 lead from half time to lose 3-2. This allowed Stockport and Altrincham to close in on us. If we lose our bottle, we could easily mess up this season and miss out on winning the league, especially when 2 of our last 4 games of the season involved both teams, these were must wins to comfortably win the league. We started getting a couple of injuries up front, so we brought in Rowan Roache(ST) from Blackpool. We showed a fine display against Chester which involved a brace from Roache in his debut, then a draw against Telford who were fighting for the play-offs. Our next game was Altrincham. 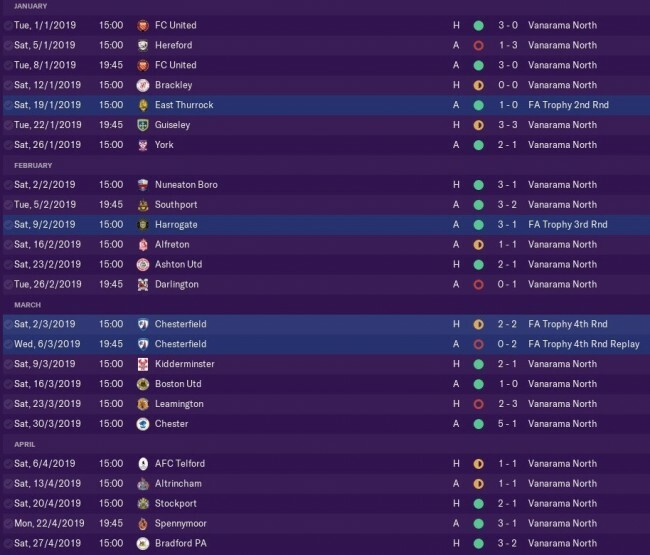 Despite conceding in the first half and Carver getting sent off, we managed to hold on for a 1-1 draw, keeping a 7-point gap between us and Altrincham. This meant Stockport were 3 points behind us and were our next opponent. We had a better goal difference by 8 and higher goals for, so unless we lost by 5 more, we would remain top. On the other side of the coin, a win would mean we would unofficially win the league. It was close and had a few scares here and there. We managed to score twice but they pulled one back just before half time. The rest of the match was squeaky bum time, but we managed to hold on to our vital lead. The job was done, we had won the league (even though the game wouldn’t like to admit it and had some doubters on social media claiming we will bottle it). Unless we lost our next 2 games against relegation threatened Spennymoor and mid table Bradford PA by 4/5, then we have won the league. We proved the overly sceptical doubters wrong by beating Spennymoor 3-1, lifting the trophy. To top things off, Stockport ended up losing to Curzon Ashton 4-3 thanks to a 93rd minute, putting them back to 3rd. We went even further, beating Bradford PA 3-2, meaning we won the league by a nice 7 points. Special mention to Rowan Roache who scored 3 goals in the last 6 games, as well as Ben Williams who won player of the season, he played in every league match along with Sousa, scored 1 and assisted 12. Sousa managed to win player of the season for the VNN, unfortunately we didn’t get the leagues golden boot or golden glove, but we conceded the 2nd least, scored the most and had the highest goal difference, I also managed to win manager of the season. Overall our loan players Souse and Williams have been instrumental to our success and I would love to have them back next year. Fortunately, Sousa is out of contract soon so we may be able to bring him in, as for Williams, Barnsley will not entertain me, saying they want Williams to play with higher quality players. As for other teams in the league, we had some shocks. The over achievers were relegation tipped Altrincham who finished an impressive 2nd, but unfortunately couldn’t make the playoff finals. Close behind were Ashton United, who did manage to make the playoff final beating Kidderminster and Altrincham but missed out on promotion to Stockport. The under achievers are easily Chester, who finished rock bottom of the league, 1 win away from safety. At the time it seemed like a regular day in the office, but in hindsight this is one of the most vital wins that helped us win the league, had we lost, we would have been ahead of Altrincham by a point, 1 result away from throwing the season away, but the return fixture where we drew 1-1 helped us lift the trophy. We had issues behind the scenes at the time, 2 rebel players and an inconsistent form. York City managed to score first but we bounced back straight away with a comical own goal, thanks to Souse crossing the ball in for it to hit the defender and bounce into the net. Reuben went on to score the winning goal in the 55th minute. On top of that it helped us push on to a further 3 wins in a row. Which one? That’s right, we beat Chester 5-1, TWICE! You would think after the previous match, they would have learned, particularly where we were losing 1-0 and scored 5 goals in the second half. But instead we won 5-1 again, with Roache scoring a brace on his debut. 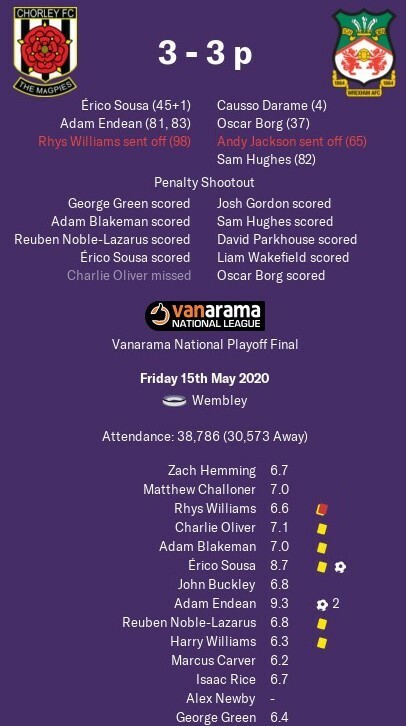 Chester were bottom of the league, but this result helped us kick off a 6-match unbeaten streak, in our final 6 games of the season. It was our 3rd to last game of the season. A win would mean we unofficially win the league, but a loss would take us back to level terms with Stockport point wise. We managed to take the lead scoring twice, but Stockport managed to pull 1 back before half time. We managed to hold our own though and got the result, putting us 6 points ahead of Stockport with 2 games left. I have history of losing the final game of the season, especially when our place is already sorted. It looked like the curse was going to carry on, losing 2-0 at half time with no fight. I slammed the team, throwing bottles and towels. Within 10 minutes of the 2nd half, Sousa managed to get 1 back, finally some effort. By the 61st minute, Sousa managed to make it level. The rest of the match was even, with it going end to end. Then, in the 89th minute, O’Keefe laid off Sousa who put the ball into the keepers bottom right side of the net to complete his hat-trick and to end the show. It was scenes! The fans falling over each other, some trying to get on the pitch, I’m sure I saw a teenager with a flare before my assistant manager jumped on top of me. What a way to end the season. Blown away by this fantastic update, so much detail and a great review of the season. I think that this could be a good way to continue formatting the story as you seem to be comfortable doing it - however do as you feel is best, is my advice. Congratulations on a fantastic season and best of luck in the National League next season. Lots and lots of detail, great update. Your update size should be to what you feel you want to maintain. Plenty of us are doing the save to write, but others are happy to update season by season. Do what makes you enjoy writing and so it doesn't feel like a task to you. That's a very good first season, congratulations on winning the title & earning promotion! Good luck next season man! Thanks all, just finished the write up for the 2nd season, it's a long one so think I will split it into halves from now on. 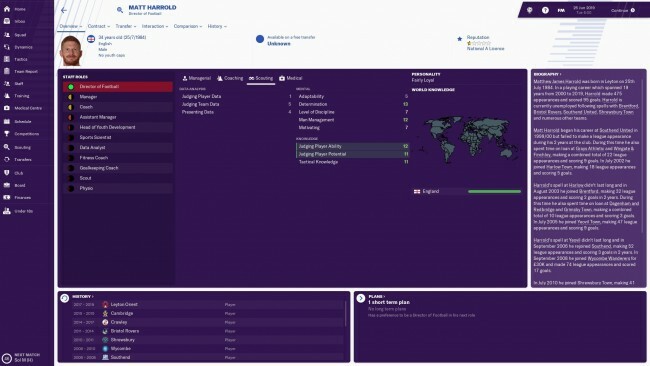 I'm near January in my 3rd season now so will write it up when I get to 2021, which will contain the pre-season, transfers and August - December, the 2nd part will have January - May, season review and highlights. This 2nd season is an interesting one and look forward to posting it. After our successful season getting promoted, it was time to start our set up for our first season in the VNL. Because everyone is out of contract in June, including backroom staff, there will be quite a bit of switching, so our minimum aim is to avoid relegation, which shouldn’t be too difficult if we keep our attackers. First, I looked at my squad to look at players I want to keep, I came to the conclusion that my must keep players were Reuben, Carver, O’Keefe and Blakeman. With Challoner, Leather, Anson, Whitham, the Newby brothers, Fletcher and Wilson as rotation and backup players. Before the season started, I saw an 18-year-old Liverpool academy reject available on a free, Rhys Williams(CB). I snapped him up immediately, so I now had a centre back in the starting 11, I just need 1 x CB, CM, AML, AMR, ST 2, x GK and LB. 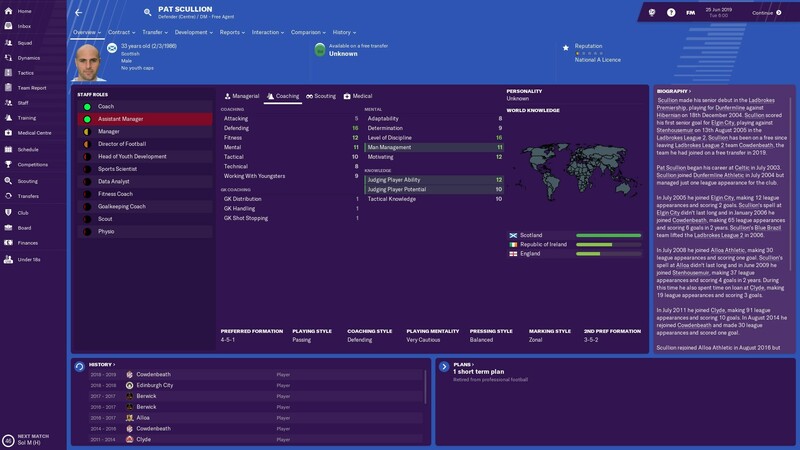 I also started looking at backroom staff as they were all out of contract, on top of that the scout I signed last season left to join Dagenham& Redbridge. 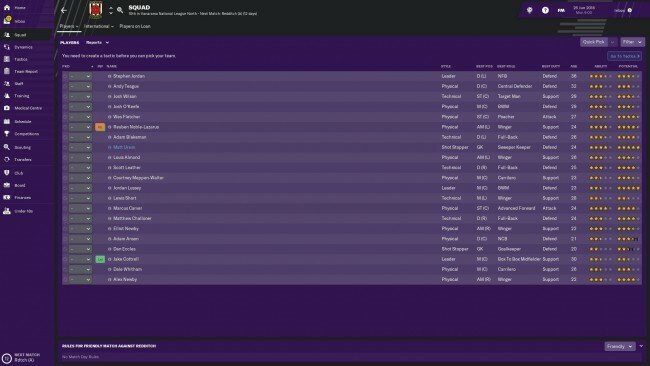 So I brought in Kevin Hunt(Scout), David Holden(Scout), Chris Bowmen(Head Physio), Gordon Bartlett(Head of Youth Development), former Cowdenbeath defender Pat Scullion(Assistant Manager) who just retired, Alex Dalton(Physio), Gareth Piper(Fitness Coach) and former Leyton Orient forward Matt Harrold(Director of Football) who also just retired. On top of that, the board agreed to upgrade the youth recruitment. I would like to bring Sousa and Williams back, unfortunately Barnsley won’t entertain me in talks of a loan as they want him to play with higher quality players. However, Sousa is out of contract for Accrington Stanley and I managed to bring him in permanently. Urwin was too hit and miss for me, so I had no plans on bringing him back. 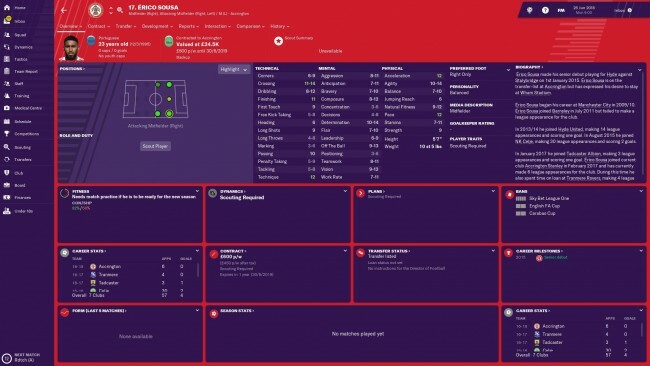 Rowan Roache looked promising and was about to sign him on a loan, buy I then found a player from Gloucester who was out of contract, highly rated by my scout and cost only 10.25k in compensation. Harry Williams(ST) managed to score 15 goals in 41 games for 19th place Gloucester, albeit in the VNS. But I decided to take a punt on him to make him the new partner for Carver. 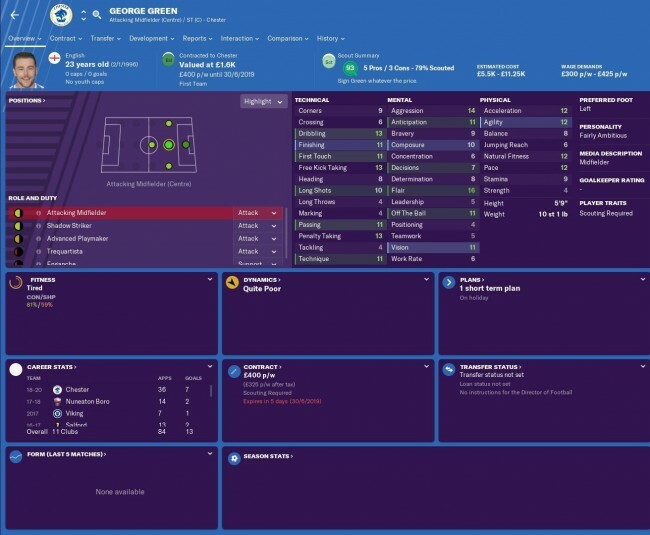 I decided to sign George Green(AMC) from Chester too to rotate with my 2 new strikers to switch between 4-2-4 wide and 4-2-3-1 wide, I was also tired of him scoring against me. I brought in Cameron Gregory(GK) on a free as my prospect/backup keeper, still looking for my main number 1. 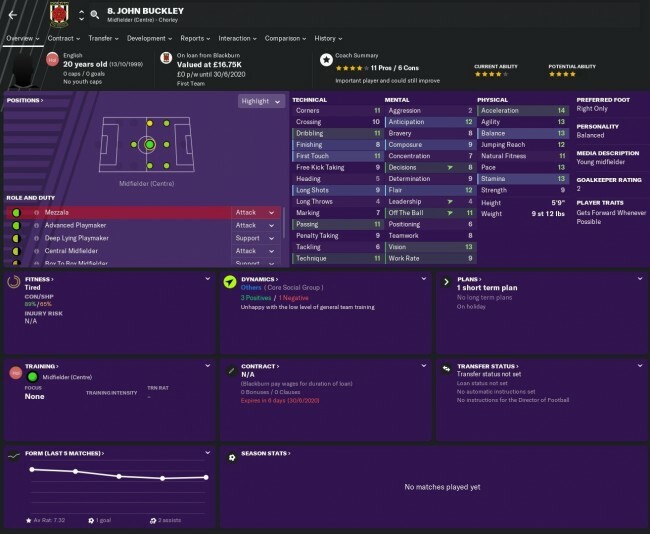 I tried some trials during pre-season too and liked the look of Zach Hemming(GK) from Middlesbrough, Isaac Rice(CB) from Sheffield Wednesday and John Buckley(CM) from Blackburn, who I loaned in to be in my starting 11, I also brought in Charlie Lyons(L/CB) as a prospect/backup left back and centre back. My main squad was set, mainly playing with the same 4-2-4 wide formation, with Hemming in goal, Rice and R.Williams as my back 2, Blakeman on the left and Challoner on the right, O’Keefe and Buckley in the central midfield, Reuben as my left winger and Sousa on the right wing, with Carver and Williams as my front 2. I could then have Gregory, Leather, Anson, Lyons, Whitham, Green, the Newby brothers, Fletcher and Wilson as my back up. If I chose to I could switch out either of my 2 main strikers for Green to play in a 4-5-1. Pre-season this time around was more to do with getting as much income as possible so that if we get promoted, we will be ready financially. That saiod I was pleasantly surprised with how things went, even though everyone was playing most of their reserve/youth team, the results were encouraging. First we played an entertaining game against Doncaster, drawing 4-4, never going behind and were ahead for most of the game until 2 goals in the last 10 minutes. We managed to win our remaining 5 games, including a 3-0 against St. Mirren, a 2-1 against Sheff. Wednesday and another nice 2-0 win against our parent club Preston. Life could have started a little bit better in our first match against fellow relegation favourites Solihull Moors. We conceded early but bounced straight back into the game, winning 2-1 at half time. However, the game was even in the 2nd half, resulting in a 2-2 draw. This is going to be a long season. However, Hemming, R.Williams, Buckley, Sousa and Carver upped their game and were the main contributors to our 4 game winning streak and before we knew it, were top of the league! On top of that, I finally won my first manager of the month award. 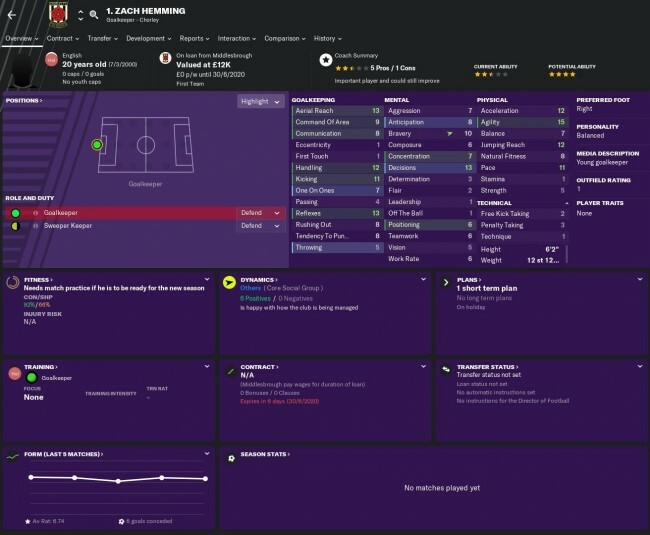 Reuben however was playing poorly and then got injured, so we welcomed our new signing, Owen Nolan(AML), who would be our backup left winger, on loan from Walsall. After an amazing start to the season, we hit the ground hard against Maidstone we were winning 2-0 at half time, then one of their players got sent off and we made it 3-0 from a penalty. Game over, or so it should be. In the 70th minute, they pulled one back, OK no big deal, 1 minute later, it was 3-2. What’s going on?! Before I could do anything, in the 74th minute, it was 3-3. I couldn’t believe it. Not going to lie, confused and angry I called it a day there and then went to bed. When I got back to work, I was already demotivated after seeing that result pop up. Next was Billericay, who despite spending 200k (not sure if they had a takeover), found themselves in the wrong end of the table. We managed to pick up a well-deserved 3 points and went on to win a further 3 games, meaning we had gone unbeaten for an impressive 10 games and sit nicely on top of the table, conceding just 7 and scored 27. 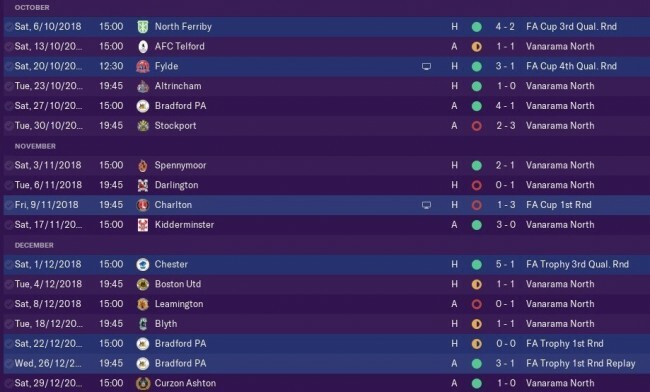 We next played Macclesfield, who despite getting relegated from League 2, were relegation favourites and with their current position, were proving why. Easy win, right? Well, just like against Maidstone, we came crashing down back to earth conceding 3, except this time for the first time this season, we didn’t score a single goal. This was not what we wanted before a run of difficult games against play-off candidates Ebbsfleet, Bromley, Hartlepool and Wrexham, before playing Aldershot who were in 2nd place. However, we picked ourselves up, scraping out victories against all bar 1, a 4-1 thumping from Aldershot. But we managed to stay top of the league, just. We decided to bring in Charlie Oliver(CB) to rotate with either R.Williams and Rice at the back, or potentially play 3/5 at the back. We finally managed to bring back Ben Williams on loan from Barnsley too. We did manage to qualify to the FA cup thanks to our 2nd team against Boston, although it wasn’t our priority. We were drawn against League 2 Morecambe and just missed out with a 2-1 loss. After that we went on to draw relegation fighting Eastleigh 1-1 and title chasing Barnet 0-0. We managed to win against our fierce rivals Fylde 2-0 however, as well as lowly Dulwich Hamlet. 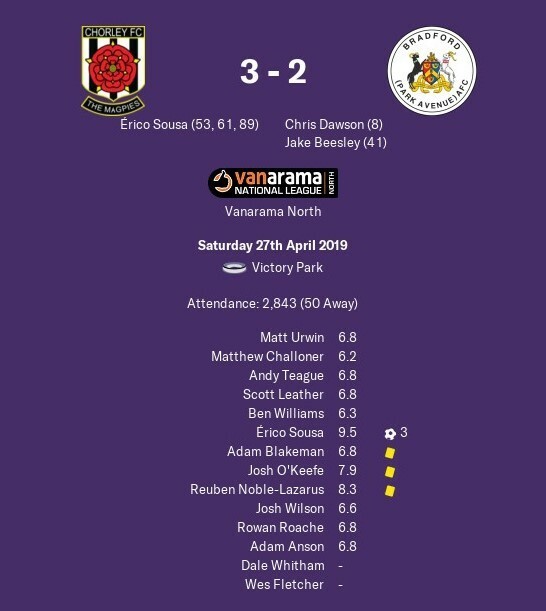 Despite being on top, we couldn’t score against under-performing Salford, nor could we get all 3 points against play off fighting Dover despite scoring 3 goals and winning 3-2 for almost the entirety of the 2nd half, until Hemming scored an own goal. At this point, we were 2nd of the league, still in reaching distance from Aldershot, but had gone well over the 50-point safety mark in the first half of the season, so anything from now is a bonus, but if we managed to get promoted, then this season will be amazing. We could easily just sit back now and let the ride continue, but we went on to go to the next round of the FA trophy, go unbeaten throughout December, ending 2019 with a 10 league match unbeaten streak and top of the league. We were on cloud 9 by the end of 2019 and despite a fortunate 2-1 win against Dagenham & Redbridge, drawing Maidstone again 2-2, we were unbeaten for 12 league matches. We then played poor Solihull Moors in the FA trophy, despite scoring early we were losing 2-1 at half time. They went on to score 2 quickfire goals in the 63rd and 66th minute. We were unable to fight back, with only a 8rth minute goal to show for our poor efforts to make it 4-2. But this was with half our 2nd team like Gregory, Leather, E. Newby, Whitham, Nolan and Fletcher, so no need to panic right? Well a fortunate 1-0 win over poor Billericay thanks to Sousa scoring just before half time could have helped lift spirits. But it didn’t. The wheels started to fall off and in February, we only managed 1 win against relegation fighting Macclesfield. We had dropped down to 2nd until we beat Macclesfield, putting us 1 point ahead. During this time, I brought in Adam Endean(CDM), initially as backup. 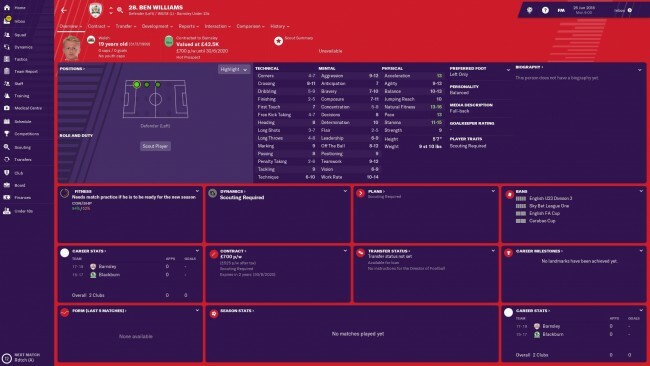 But because we started conceding a lot of long range goals and Ben Williams was playing so poorly, I played Blakeman at left back again to have B.Williams as back up left back, then have Endean as a back-up midfielder to be brought on if we need extra support in defence. During February, we had a takeover, a local businessman Mark Blower took over from Ken Wright. This allowed me to change our season aim from avoiding relegation, to finishing to table. Don’t know why, it was the highest I could go for, but we had already reached it practically, we’re not going to go below 12th with 70 points and over 10 games to go. I also managed to get a new contract, giving me some job security. 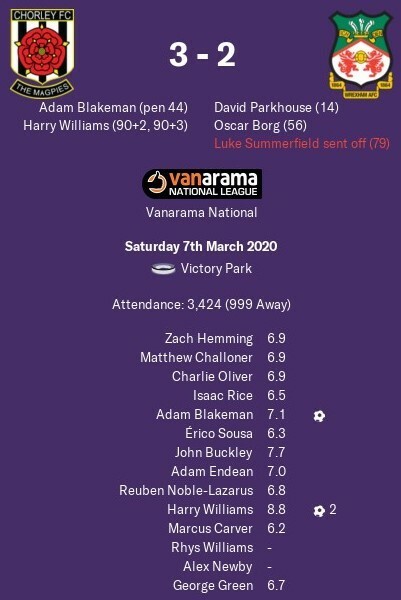 We kicked off in March against Ebbsfleet at home, Adam Endean’s starting debut, we managed to batter Ebbsfleet 5-0, my biggest victory. Endean bossed the midfield along with Buckley and appeared to be the missing piece to the jigsaw puzzle which could see us miraculously get promoted or even win the league. It won’t be easy as we then faced our next run of hard games against Wrexham, Hartlepool and Aldershot, then lower mid-table Boreham before facing 2nd place Barnet, just 4 points behind us, only because they are on a spell of poor form too. We managed to get results against Wrexham, Aldershot and Boreham, as well as a draw against Hartlepool. We next face Barnet, who were 7 points behind thanks to their horrid run from mid-February to mid-March, unable to win a match for 6 games in a row, including 2 losses while we beat Ebbsfleet and Wrexham, bumping our 1 point lead to a 7 point lead. A win would put us 10 points ahead with 5 games to go, very reminiscent of last season with Altrincham and Stockport. 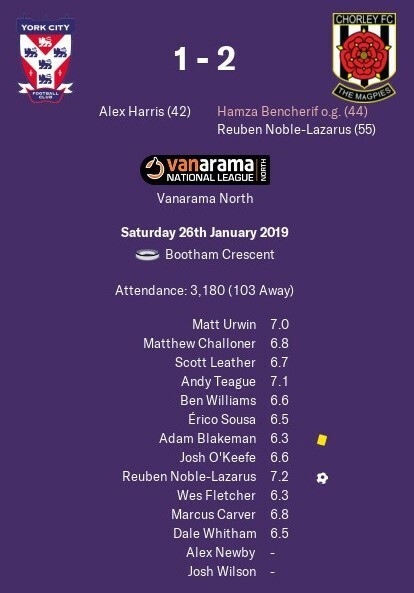 It was a hard, even match, Barnet had stats slightly in their favour, with 10 to our 8 shots, 5 to our 3 on target, even having a penalty just before half time that was saved by the almighty Hemming. Besides the penalty and having slightly better chances, the possession was bang on 50/50 and it proved so in the highlights. It wouldn’t be remembered for being a high scoring game but a close game to help decide who the champions of the league will be. In the end, the only deciding factor was a goal in the 71st minute from Barnet, making it 1-0, meaning they were 4 points behind it was going to be a long 5 games. Fortunately for us, after our hard run of games, we had an easier set laid out before us, most of whom being in the lower end or as far as being in the relegation zone. Teams included Eastleigh, Fylde, Dulwich and Salford, who we managed to get 8 points from this season. 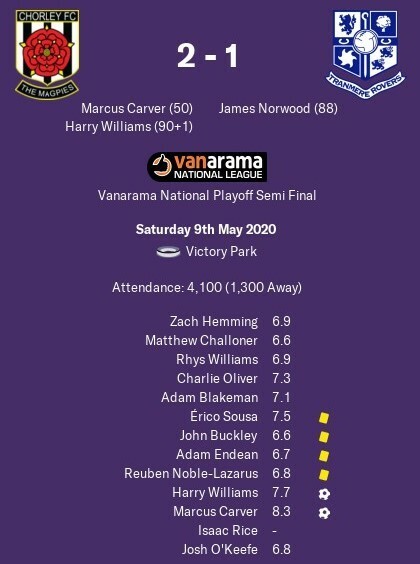 Before we faced Dover who are fighting for one of the last spots in the play-offs, but we also managed to get a draw from in the reverse fixture. That means if we got the same points this time around, we would get 9, which would be enough if Barnet fail to win all of their next 5 games, or if they do, it would mean we would have to turn one of them draws to win the league by goal difference. Alternatively, if we win 4 of the last 5 games, the title is ours. On paper, we have the advantage, we just have to get the job done. First up, was Eastleigh, arguably the easiest game. It was close, too close for my liking with the stats only slightly in my favour, but Eastleigh managed to score in the 94th minute, heart breaking moment. Barnet beat Harrogate 3-0 and are 1 point behind. We next faced our fierce rivals Fylde, we managed to score 60 minutes into the game, but Fylde equalised in the 77th minute and held on for a draw. Barnet managed to beat Dagenham & Redbridge 2-0, they are now on top with 1 point to separate us. Things were beginning to look bleak. Next was Dulwich, who we managed to beat 2-0, but Adam Endean got sent off which is a big loss, as he has been key to our recent turn in fortune and will be a big loss. Despite not having Endean, we managed to beat Salford 2-1, however Barnet managed to beat both Billericay and Maidstone, still 1 point ahead. It was the final game of the season, Dover, who had secured their play-off place at this point and had nothing to play for. Barnet on the other hand face Leyton Orient who are mid table and have nothing to play for. I decided to stay faithful of O’Keefe and the starting 11 of Salford, despite having Endean back. It was a close game, again, but this time the goal was scored just before half time, by Dover. We tried to fight back, but it wasn’t to be, we finished our season with a poor 1-0 loss to Dover, not that it mattered, as Barnet managed to beat Leyton Orient 1-0, we finished 2nd, with an impressive 93, the same as previous champions Chesterfield, but 4 points behind Barnet, Vanarama National League champions 2019/20. No need to be down, yes we messed up a 7 point lead at the end of the season to be 4 points behind the team that beat us and won all of their last 8 matches to win the league, when we were top of the league for 3/4’s of the season. But we had succeeded our goals to firstly, avoid relegation and a new objective, to finish in the top half. On top of that, we have the play-offs to look forward to! First, we faced Tranmere Rovers, who managed to beat Aldershot 3-1 in the first round. We scored in the 50th minute thanks to Marcus Carver and were able to keep our lead until the 88th minute thanks to James Norwood equalising for Tranmere. But Harry Williams managed to score 3 minutes later to secure our place in the play-off final, we’re going to Wembley! Wrexham was our opponent, who managed to beat Dover. We managed to beat Wrexham twice this season, but it wasn’t going to be that easy. I decided to stick with my team against Tranmere, which brought Endean back into the fold. It kicked off, 1000’s of outnumbered Chorley fans were chanting and screaming, there was an electric buzz in the air. 4 minutes later, Wrexham had the upper hand, showing us we would have to work hard to get a result here. Wrexham were bossing us for most of the match and grabbed a second goal in the 37th minute, it wasn’t looking good. However, just before half time, Sousa somehow scored against the run of play just before half time. We were starting to get ourselves back into the game in the second half. We managed to get some mighty help come the 65th minute, when Andy Jackson got sent off for Wrexham. Adam Endean managed to equalise in the 81st minute, but 1 minute later Sam Hughes scored to make it 3-2. But 1 minute later, Adam Endean, again, scored the equaliser. What is going on?! We were pushing them further and further back, but we were unable to score the winner before full time. We went out again at extra time and went pushed even harder, missing 2 1-on-1’s from H.Williams and Carver. Then, disaster. Rhys Williams got a deserved second yellow card. I screamed, I couldn’t help myself. As a neutral, this game is amazing, but for me, well, let’s just say my finger tips are bleeding still to this day. For the rest of extra time, both teams were defensive with 10 men, rather risking penalties than leave their blind spot too vulnerable. So it came, Hemming has had a decent season when it comes to penalties so I was pretty optimistic, however I don’t have the best penalty takers, especially with my joint best penalty taker, O’Keefe, being on the bench. It was goals galore, they scored, then we did, then they did, then we did. It was 4-4 and on the 5th penalty takers. 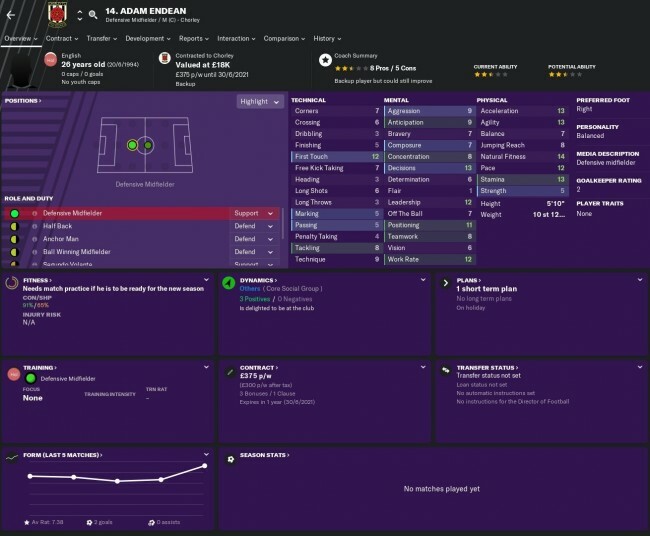 Up came Oscar Borg, who I had on trial in my first season and tried to sign, but instead signed for Wrexham. He also managed to score the 2nd goal today, as well as Wrexham’s 2nd goal when we won 3-2. He takes a few steps back, runs up, shoots. Goal. Next up, our Charlie Oliver, who has been a rock for us at the back this season, has now got to prove his finishing prowess. He takes a few steps back, runs up, shoots. Save, straight in the middle, the keeper didn’t even move. That concludes that then, a heart-breaking end to a wonderful season. Well, not sure what to say, it looked like we could get a magical 1st season in the VNL and get promoted, but it wasn’t to be. I think it would be unfair to say we bottled it considering avoiding relegation was our main aim, but to lose a lead like that and lose in the play-offs to a 10-man team we beat twice, in penalties, is just, well, painful. That said it puts us in a good spot for next season. The lads are aiming for the play-offs again next year and with some key signings, it should be easily do-able. There are some players who I will need to let go as I think I will go all in next season in terms of signings which may hurt our balance, but it we keep our core squad, build on it, bring in future prospects, promotion next year should be a good aim. I will also be focusing more on the cup competitions, including the FA trophy. So let’s look at our players. 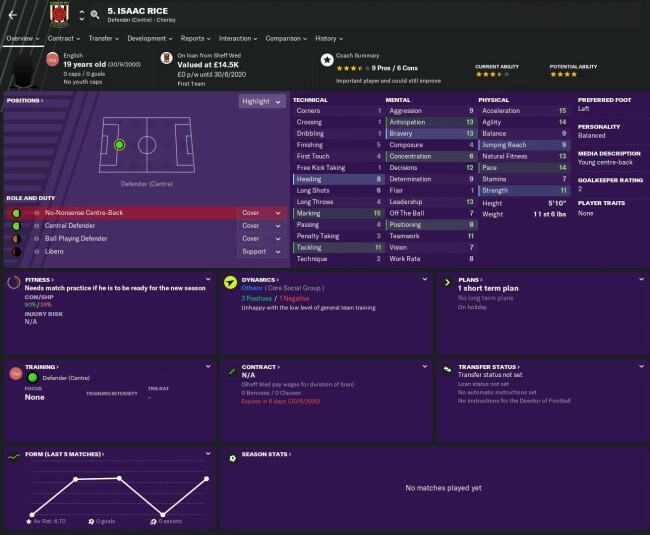 We managed to bring in some decent youth players this year around, in particular Washington Ndlovu(CM) and Drew Hardy(ST), great names by the way! We were the clear overachievers this season, besides us there’s Bromley who were tipped to be in a relegation fight, but managed to finish 8th, 5 points short from the play-offs. Last season I though Chester were massive ‘shock’ underachievers, but Salford this season topped that. The title favourites are relegated to the VNN with a disappointing 41 points. This game still haunts me to this day, but if there’s a game that perfectly sums up our season, it’s this one. 2-0 up at half time thanks to Sousa and H.Williams, then Maidstone were reduced to 10 men before O’Keefe finishing the game off with a penalty. Then, it all fell apart within 4 minutes at the 70th minute mark. It’s games like this that led to us losing our lead. My best victory to date and a well-deserved one. On top of that, my new signing H.Williams won the match ball with a hat trick. Not much else to say, just a brilliant performance. 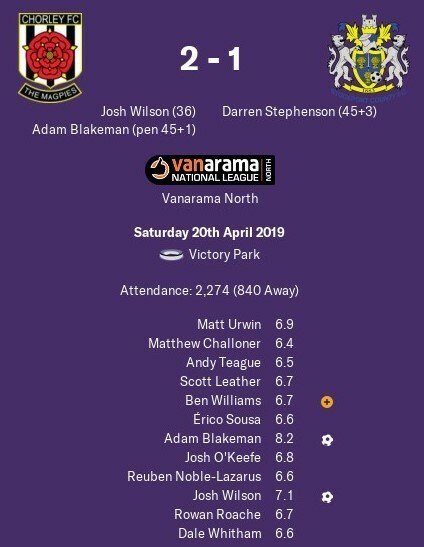 Was a tough game against fellow play-off candidates Wrexham, but we managed to grind out the result. Wrexham took the lead in the 14th minute, but we managed to equalise just before half time thanks to Blakeman’s penalty. 10 minutes after half time, former Chorley trialist Oscar Borg scored to make it 2-1 for Wrexham. 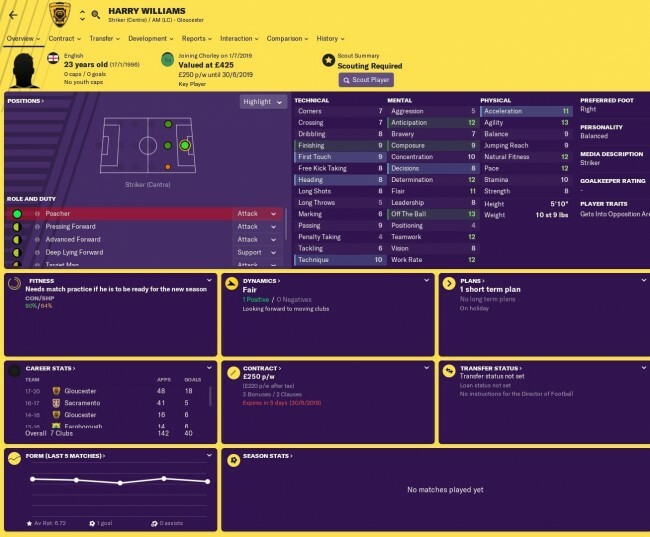 In the 79th minute, Summerfield got sent off for Wrexham, so we tried to go all out attack, it looked like it wasn’t to be, but then, Harry Williams scored in the 93rd minute. Get in! An important point that would help us improve out 4 point lead at the top of the table to 5. Then, while we were still celebrating, Harry Williams scored a minute later to make it 3-2 and give us those important 3 points. The fans were still celebrating the equaliser and weren’t sure what was going on, is this real life? We are now 7 points clear! This was in the middle of our hardest run against teams in and around the play-offs and I feel this result helped us grab results from the other games. Our first match in the play-offs and what a match it was. Both teams were even, with the first goal coming from us in the 50th minute. It looked like it was going to be our day, but then, James Norwood scored for Tranmere late into the game to make it 1-1. Looked like it would go to extra time. But then, Harry Williams scored the last minute winner to put us in the play-off final. The final chapter to a wonderful story, however, not all great stories have a happy ending, but this one was certainly one to remember. It started off negatively, with Darame scoring early on in the 4th minute to give Wrexham the lead. Oscar Borg doubled their lead in the 37th minute. At this point, we were all over the place, but out of nowhere, Sousa got 1 back to make it 2-1 just before half time. We were playing poorly but were still in it. It was a game of 2 halves, while we were getting battered in the first half, we managed to get back into the game. In the 65th minute, we got some extra help, when Andy Jackson got sent off for Wrexham. We were pushing and pushing, it looked like it wasn’t going to happen though, with Harry Williams and Marcus Carver missing a few one-on-ones. Then, Adam Endean managed to equalise in the 81st minute! We stadium was bouncing, but before things calmed down, Wrexham got the lead back straight after kick-off. I felt like someone punched me in the stomach. Then, while the Wrexham fans and staff were still celebrating, Adam Endean equalised straight after kick-off! What is happening?! Most of the Wrexham fans stood there in dead silence, while most of the Chorley fans were falling over each other celebrating, while everyone else just stood in bewilderment, not idea what just happened and what to do. We were on top for the rest of the game, but we couldn’t get the winner. Full time, time for extra time and we still had a man extra. Wrexham were clearly going defensive, either hoping for the perfect time to attack, or wait out for penalties. We were still on top, then disaster. Rhys Williams got sent off. The last 20 minutes were a nail-biting but dull, as both teams were sitting back to counter or wait for penalties, which eventually arrived. Everyone managed to score their penalties by the 5th penalty, making it 4-4. Our former trialist Oscar Borg stepped up for Wrexham, scored. 5-4. Charlie Oliver steps up for us, our best defender this season, misses. 5-4. Season over and we miss out on promotion to a team we managed to beat twice in the regular season, in penalties. Magical season with a tragic ending. A heartbreaking end to what was otherwise an exceptional season, where you and the squad have massively overachieved. The playoffs are incredibly difficult to win, as it truly is a lottery. Hopefully, you'll learn from your experiences and come back stronger next season. You did so well to reach that stage, next season will be even better! You are reading "Rise of Chorley".